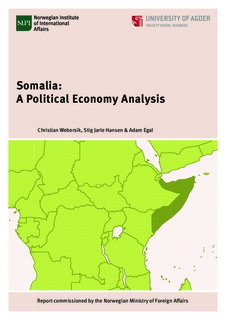 Somalia has been without a central authority for more than a quarter century. An entire generation is growing up without experiencing stability and security, basic human rights, and economic prosperity. There is no functioning central government with authority over the entire country, extreme weather impacts the country unmitigated, and social challenges such as corruption are rampant. This bears several risks, such as support for radical Islamist groups, such as Al-Shabaab, posing a threat to domestic and international security, or a brain drain with large number of people fleeing the instability and conflict in Somalia. Informal governance actors, formal local authorities, and the private sector have filled the gaps in providing security, education, and health services. Yet, powerful formal and informal, national as well as international actors have vested interests in a weak state or governance failure, with conflict and instability becoming self-perpetuating. This political economy analysis sheds light on the actors, their interests, and power relationships, thus providing a better understanding of these arrangements and their relation with the wider state-building efforts.